BY JAMES K. DITTMAR, PH.D.
Dittmar: In his definition, Robert Greenleaf uses this phrase “natural feeling” to describe the starting point for someone to want to become a servant-leader. What do you think he meant by that phrase, “It begins with the natural feeling,” in terms of becoming a servant-leader? Spears: Robert Greenleaf believed that most people have an innate desire to serve others, but he also believed that institutions and society didn’t tend to encourage this kind of behavior as much as some others. To some degree, I believe he was also intending to suggest the importance of intuition. We talk more about intuition today than was the case thirty-five years ago when Greenleaf was writing about this. For Greenleaf, that natural feeling was something that he occasionally observed in leaders at AT&T during his 40 years there, and where he was really a good judge of leadership talent. His observation of effective leadership traits led him to identify those who had a natural inclination towards serving others. Dittmar: So perhaps the idea that assuming the role of servant-leader “came to them naturally” meant that it was part of who they were, as opposed to the belief that every person in the world, by his or her very nature, has the same capacity to become a servant-leader. Do you think Robert Greenleaf would have made that distinction? Spears: Well, yes and no. Greenleaf clearly believed that some people were more predisposed toward being natural servant-leaders than were others. And yet, he also believed that one could learn to be a servant-leader, and that’s a very important point from my perspective. We’re not all natural-born servants; some of us learn to be servant-leaders only through the school of hard knocks, or sometimes through a slow, internal evolution. I think Greenleaf really wanted to encourage natural servants to perhaps overcome some aspects of their personality that might keep them from seeking leadership positions within organizations. His belief was that if natural servants began to get more involved in leadership, then organizations and society would benefit tremendously. Dittmar: We are very interested in developing servant-leadership attitudes and behaviors in our students. You just stated, “Greenleaf clearly felt that you can also learn to be a servant-leader.” What are some of the most effective methods of developing servant-leaders? Spears: Encouraging people in their own service impulses; doing your best to live your own life as a servant-leader; accepting people for who they are; focusing on personal examples of servant-leadership within each person’s life; sharing a variety of learning tools on servant-leadership. 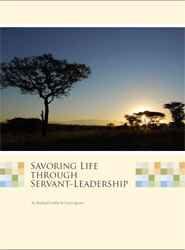 I believe that the single best starting point for most people who want to read about servant-leadership remains Robert Greenleaf’s essay The Servant as Leader. The ideas of servant-leadership may be communicated in many ways. The personal development of servant-leaders can be enhanced by showing them love, acceptance, and encouragement. I’ve also seen the benefits of service-learning projects—deeply grounded in the values of servant-leadership—as a method capable of igniting the servant’s heart in students. Dittmar: How do you view your role at the Greenleaf Center? What are you hoping to accomplish through the work that you do there? Spears: Well, I’ve been with the Center for sixteen years, having started in early 1990. By the late 1980s Robert Greenleaf had withdrawn from any active involvement with the Center, and serious questions had arisen as to its future. Robert Greenleaf was in declining health, he had operated the center for 25 years as sort of a hip-pocket organization with a tiny budget, maybe $50,000 a year, and most of that coming from a series of grants from Lilly Endowment. From its founding in 1964, up until the late 1980s, Bob Greenleaf had utilized the Center in ways that were helpful for him in his own research and writing. In that way, it served a very important function for him as an organization and as a means to an end. But he had not ever really sought to develop the Center as a strong organization, and so by 1988, when he had the first in a series of strokes which ended his active work life, the Greenleaf Center board began to look at what might be the future of the Center. There was some disagreement at the time as to what it might become and, in the end, that part of the board which believed that it might have a great mission in the world won out. In late 1989 the board made several decisions aimed at moving the Center into a more active direction. One of those decisions involved moving the Greenleaf Center from the Andover-Newton Theological Center campus (outside of Boston) and to go to Indianapolis. The other major decision was to hire the first full-time director, which turned out to be me. My first few years with the Center were spent, in no small measure, identifying ways of first stabilizing and then growing the organization. I have spent the past thirty years as a non-profit executive and, over time, I’ve developed some strongly held ideas about the effective development of non-profits in general. The most stable non-profits are those which, when possible, develop revenue streams which are also organic expressions of their mission. That general approach can enable an organization to develop some measure of freedom from having too heavy a reliance upon either individual donations or grants from foundations. Relying primarily upon donations and/or grants is an iffy kind of way to run an organization. And so I set out to create multiple revenue streams that were also organic expressions of our organizational vision and mission. We started with the establishment of our partnership (membership) program. 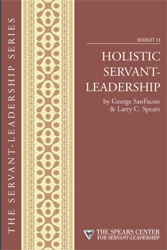 Next, I began to expand the number of publications on servant-leadership. 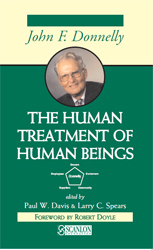 In 1990 the Greenleaf Center sold only Robert Greenleaf’s two books, plus a dozen essays written by him from 1970 to 1988. Today, we sell over 140 different essays, books, manuals, videos, etc. to customers around the world. In 1991, we launched an annual conference for servant-leadership which has become a major program and a major revenue source for us; and in 1995 we launched our Leadership Institute for Education. Now in its eleventh year, our LIFE program has had over 400 participants from more than 200 colleges and universities. In the early ‘90s we also created a workshop program which, over time, evolved into what we call today our Servant-Leader Speakers Bureau. During this time I’ve worked to develop a succession of income-producing programs which has helped us to grow dramatically. 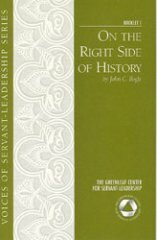 Another major development: In 1994 I was approached by John Wiley & Sons and asked if I would be interested in producing a book on servant-leadership. 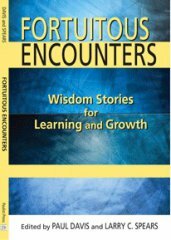 That led to the creation of the first in a series of anthologies on servant-leadership that I’ve produced over the years. That first book was titled Reflections on Leadership: How Robert K. Greenleaf’s Theory of Servant-Leadership Influenced Today’s Top Management Thinkers (1995, John Wiley & Sons). 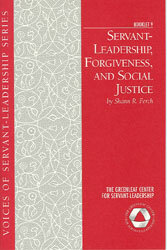 It was well-received and sold well, thus launching a major aspect of my personal work at the Greenleaf Center—the creation of a succession of books and essays which have proven to be a great way of getting the word out on servant-leadership while generating substantive income for the Center. 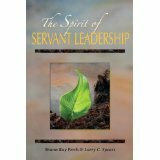 I’ve developed an approach which basically has found me creating books of one kind or another—two of them: Seeker and Servant (1996, Jossey-Bass) and On Becoming a Servant-Leader (1996, Jossey-Bass) were collections of Robert Greenleaf’s unpublished writings; two more, The Power of Servant-Leadership (1998, Berrett-Koehler) and The Servant-Leader Within (2003, Paulist Press) involved gathering together his separately published essays and publishing them in book form; one book, Servant Leadership: 25th Anniversary Edition (2002, Paulist Press), involved creating a new edition of his classic, 1977 book, and adding substantive new material to it by way of a foreword by Stephen Covey and an Afterword by Peter Senge. I’ve also created four contemporary anthologies of essays on servant-leadership in a wide range of applications and practices: Reflections on Leadership (1995, John Wiley & Sons), Insights on Leadership: Service, Stewardship, Spirit, and Servant-Leadership (1998, John Wiley & Sons), Focus on Leadership: Servant-Leadership for the 21st Century (2002, John Wiley & Sons), and Practicing Servant-Leadership (2004, Jossey-Bass). I am presently editing material for our next anthology. Creating these books has become an immensely satisfying part of my own work, and an important part of our organizational focus, and these books have served to carry forward our mission in a more robust way and to generate revenue both through our own sales of them as well as royalties. One hundred percent of the royalties on all nine of the books I’ve created has gone to support the ongoing work of the Greenleaf Center. That’s sort of how my work has evolved over time. At this point in time, two of my primary interests involve the creation of publications, as well as nurturing the growing global interest in servant-leadership. Dittmar: Why did the board choose Indianapolis as the headquarters site? Spears: Two reasons: one was that Robert Greenleaf was actually a consultant to Lilly Endowment for about ten years in the 1970s. 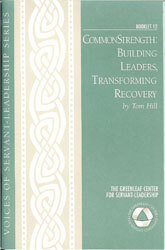 As a result of his work with Lilly Endowment, they eventually identified servant-leadership within the context of helping nonprofit boards to function as servant-leaders, and Lilly Endowment began to fund a succession of programs and projects which, over the years, has probably involved the funding of hundreds of programs on board training and board development which have been influenced by Robert Greenleaf’s essay, Trustees as Servants. So in 1989, the Greenleaf Center board saw that Indiana had many, many organizations and people who were already committed to servant-leadership and were actively working with it. The board felt that it was probably the best state for locating our headquarters. The other reason why the Center wound up in Indianapolis was that Robert Greenleaf was asked in 1989 where would he like to see the Center go. I think he surprised some people by saying he would like to see the Center move to Indiana. Bob Greenleaf was born and raised in Terre Haute, Indiana, and upon his death in 1990 he was buried in his native Hoosier state as he had requested. Dittmar: Do you see yourself as someone who’s in a position to shape the thinking of servant-leadership from this point on? Or do you see it more as facilitating the development of others’ ideas? Spears: That is actually a very profound and personal question that I am wrestling with. Up until now I have seen myself more in the role of facilitator--providing opportunities for many voices on servant-leadership to be heard. From the start, the idea of allowing opportunities for people with very different perspectives on servant-leadership to have their voices heard through the published anthologies, and through presentations at our conferences, has been highly satisfying. Over one hundred contributing authors have been included in the four anthologies I’ve done to date. And our annual conference has enabled something like three hundred speakers to share their wisdom and ideas with others. I’m absolutely convinced that both of these activities have contributed vitally to the explosion of interest in servant-leadership in the last fifteen years, and to the development of the Center. I expect that I will always see that as an important part of my work, and I hope to continue to edit servant-leadership anthologies for many years to come. However, it is also the case that my own thinking about servant-leadership has continued to evolve and to grow over time. I’ve written over two hundred articles on servant-leadership for many different publications--some have focused on characteristics, some on applications of servant-leadership in businesses and in other kinds of organizations, some have focused on Robert Greenleaf, etc. 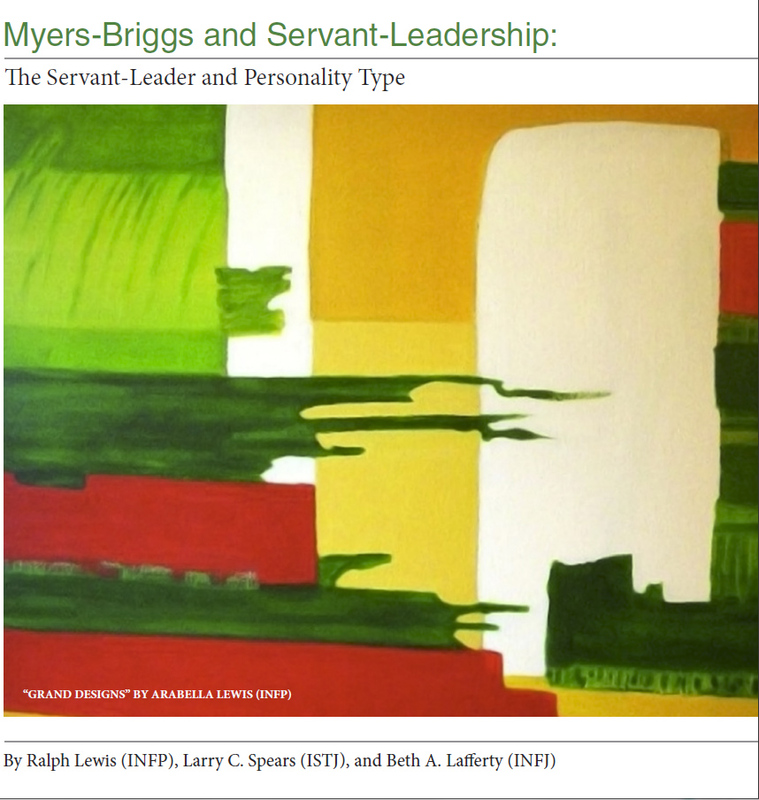 Recently, I’ve begun to develop some quite specific interests and ideas in servant-leadership, including a lengthy essay on servant-leadership in relation to the Myers-Briggs work, and which I’m currently developing with a colleague. I have also begun to gather together my own writings from the past sixteen years. I have a number of ideas that have been sort of gestating for some years now, and I am feeling like it is time to give birth to them! Dittmar: The Myers-Briggs essay sounds interesting. Would you elaborate on that project? Spears: I’ve had a longtime interest in Myers-Briggs literature. I have found some helpful insights along the way, both personally and professionally. My wife, Beth, and I have enjoyed many conversations about our Myers-Briggs types, and we’ve found it to be a useful path toward understanding our own types. Greenleaf Center staff members and I also did some work around it a half-dozen years ago. About four or five years ago I had a conversation in which I was asked whether I thought that there were certain Myers-Briggs types who might not be capable of being servant-leaders. I thought it was an interesting question, and it got me to thinking about servant-leadership and Myers-Briggs in relation to each other, rather than as separate ideas. Long story short, I’ve come to conclude that anyone can be a servant-leader—no matter what his or her Myers-Briggs type. Of course, different Myers-Briggs types are likely to express their understanding and practice of servant-leadership somewhat differently. Servant-leaders come in all shapes and sizes and Myers-Briggs types! What I find most useful in pairing servant-leadership and Myers-Briggs is the way in which Myers-Briggs can help us in our understanding as servant-leaders—both of ourselves and others. 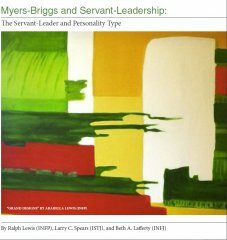 Together with a colleague in the United Kingdom, I want to focus a little energy through an essay on the theme of servant-leadership and Myers-Briggs types. I would like to try and dispel any suggestion that only certain Myers-Briggs types can be servant-leaders. I’d also like to try and help all of us who aspire to servant-leadership to make more effective use of Myers-Briggs to better understand ourselves and others. We’ve been working on an essay that I hope will be ready for publication in 2007. Dittmar: In terms of your thoughts on leadership theory and development in general, besides servant-leadership, what do you think are some of the more influential or interesting leadership theory developments in recent time? Spears: Well I think that those which have had the greatest meaning for me probably are Robert Greenleaf’s writings and thinking on servant-leadership; Margaret Wheatley’s groundbreaking work as reflected in her book, Leadership and the New Science; and Peter Senge’s work around systems thinking, which has powerful ties to servant-leadership that are beginning to be explored and written about in some meaningful ways. My primary interests in leadership education have always been upon servant-leadership, but in relation to a wide range of partnering ideas. I don’t see servant-leadership as a style of leadership; for me it’s a philosophy and a way of being--it’s who you’re trying to become; it’s what many organizations are trying to grow into. None of us ever reaches the final goal line as a perfect servant-leader, but our journey toward becoming a servant-leader is so enriching. I’d just like to try and develop a bit further some of the conceptual edges of servant-leadership in the coming years. Dittmar: I think some of our students come to see servant-leadership as either the foundational or umbrella-like concept, sort of as a framework, within which other leadership models are played out. For instance, a situational, transformational, or Rostian [based on the leadership definition of Joseph Rost] who understands the servant-leader framework and works as a situational, transformational or Rostonian leader within that framework. Spears: Well, I also see servant-leadership as a foundational idea upon which a great many related approaches may be more securely built. Servant-leadership provides a stronger foundation for any kind of leadership “house,” because it is so clearly about values and ethics and wanting to serve others. There isn’t a great idea or system that can’t be enhanced by that foundation! Dittmar: When you developed the 10 characteristics of servant-leadership, what process did you use to develop that? I understand it’s based on your review of his materials, but how do you recall arriving at those 10 descriptive terms? Spears: You are asking some really wonderful questions here … drawing out from me a few things that I've never written or talked about much, though I’m happy to do so. I knew of Robert Greenleaf’s writings since the early 1980s when I worked in Philadelphia for the Quaker magazine Friends Journal. The Journal had published a number of his articles over the years, and so I was familiar with Greenleaf’s writings on servant-leadership and thought it made a great deal of sense a decade before I ever came to the Greenleaf Center. As I began to talk to people in the early 1990s, I realized that there were many people for whom Bob’s foundational essay, The Servant as Leader, just spoke to them with great clarity, and that it had energized them. I also found, though, that there were about as many people who said things to me like, “Well, you know I’ve tried several times to pick up and read that essay and I just cannot get through it.” That was the kind of frustrated expression that I frequently heard from many sincere seekers and practitioners—particularly among students, businesspersons, and others. As I began to think about how best to encourage as many people as possible to get interested in the understanding and practice of servant-leadership, I began to think in a more conscious fashion about the fact that different people learn differently (I’ve also had a longtime interest in both critical thinking and in experiential learning—both have been helpful approaches for me personally, and I think my interests in both have helped in my work with servant-leadership). Anyway, I believe strongly that Greenleaf’s essay The Servant as Leader connects very well with people who are strongly conceptual, who like to play with ideas, and who are more attuned to making intuitive leaps. 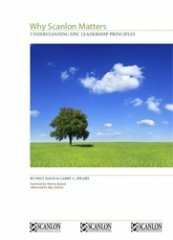 In lifting up Greenleaf’s characteristics of a servant-leader, I thought that I might be able to develop a list of servant-leader traits which might speak more directly to many people as their initial introduction to servant-leadership. I saw these characteristics as another possible pathway into servant-leadership—particularly for folks coming from a perspective of applications, or personal modeling and development. 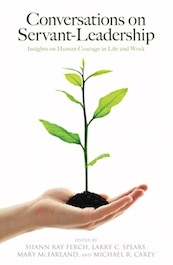 I also saw the characteristics as a natural companion to Greenleaf’s more conceptual examination of servant-leadership. I had read and reread Greenleaf’s writings, and I gradually began to notice in different places in his essays and books a series of seemingly isolated characteristics of servant-leadership in which Bob would write about them, though not necessarily in an organized fashion. On one page he would write about foresight, twenty pages later he would write a great page on listening, and in another book or essay, he wrote eloquently on persuasion, etc. Like any good researcher-organizer, I began to see patterns emerging in his ideas, and I started to make notes on all kinds of seemingly disconnected traits and thoughts that popped up throughout his writings. At some point Greenleaf’s thoughts on servant-leadership characteristics coalesced as a group in my own mind. 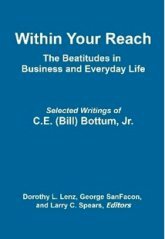 I simply extracted them from his various writings and pulled them together with the belief that they might prove helpful for many people as a means of easing into servant-leadership. Over the past decade I have found many people along the way who have confirmed my initial belief. So many people have told me that they could not get into Bob’s essay at first, but that they found in the list of characteristics, or in my own straightforward narrative articles, a clearer introduction to servant-leadership—something which allowed them to get started along their own path of self-discovery. I’ve read all of Greenleaf’s writings, published and unpublished, numerous times, and his elliptical writing style can be challenging. It requires your full attention! And yet, it yields its secrets to careful and repeated readings. The Servant as Leader is one of the most profound essays I have ever read by anyone, on any subject. 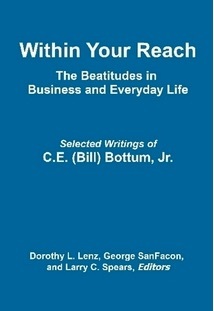 I am grateful that many people have gotten hooked on servant-leadership through reading my own articles, chapters, etc. on servant-leadership. However, I am always quick to tell anyone: You simply can’t understand fully Robert Greenleaf’s ideas on servant-leadership without several careful readings of The Servant as Leader! I think what has happened, in part, is that a lot of people have gained entry into servant-leadership through thinking about these characteristics as it relates to individuals in their own lives. I am also quick to state that these ten characteristics are not a definitive list. They are simply the ones which appear with considerable frequency in Greenleaf’s writings. Dittmar: It is a very helpful summary. Often it is the point where people start understanding or getting the conceptual framework. Spears: Well I think that’s right, though I am occasionally asked by someone: “Why isn’t this or that also included in my list of characteristics? My response is always the same: I sought to extract from Greenleaf’s own writings a relatively brief list of characteristics, and the ten which I selected appeared to me to be the ones that Greenleaf suggested were most important. People have asked me, “Why isn’t ‘love’ or ‘trust’ (or any number of other words and phrases) among the ten?” I certainly agree that love, trust, and other characteristics are quite legitimate ways of looking at servant-leadership. I’ve taken great care to state many places that these ten characteristics are not intended to be any kind of complete listing. On a related point, there is no particular order of importance for the characteristics except for the first one: listening. Greenleaf was a strong believer that great servant-leaders are really good listeners. In some ways, these characteristics have taken on a life of their own in a way that I don’t think I ever imagined would be the case. On the plus side, over the past decade I’ve read several dozen fascinating dissertations, papers, and articles analyzing the list of servant-leadership characteristics. I’ve been grateful for the careful interest of others in the list, and to see how others have further developed this particular piece of work into some fascinating and unexpected directions. I have also had a couple of occasions where I’ve been unpleasantly surprised. I think the most surprising example for me was when someone took these ten characteristics and recast them in the form of ten “thou shalt nots”! No doubt they were well-intended, but the listing of characteristics is not a set of edicts. Despite the occasional misinterpretations, there’s not a doubt in my mind that the work around the characteristics has been very helpful for a lot of folks. While I don’t see the characteristics as being all that important to a deep understanding of servant-leadership, I do believe that they have proven to be an extraordinarily effective way of getting people to poke their head in and to begin to explore the subject matter of servant-leadership. Actually, I do think it’s pretty important in terms of understanding at a personal level what being a servant-leader is about and how you can begin to sort of work on becoming a servant-leader. If you look at the list of characteristics, we generally have some that we’re probably naturally good at, and others that are more challenging, and I think that this can be a helpful focus for our growth as servant-leaders. I find some satisfaction in having been an effective and faithful interpreter of Robert Greenleaf’s servant-leadership ideas, and in figuring out some creative methods that have helped to make his work far more popular today than was the case prior to his death in 1990. Dittmar: How did you decide on the 10 particular terms you used as descriptives? Do you recall wrestling with what terms to use? Spears: This was probably 1992, or 1993. What I do recall very clearly was that I wanted to make sure that I used the characteristics that Robert Greenleaf had used. And so I did not seek to rename anything. I took word-for-word each of the characteristics, and most of these are one-word terms. They were elements that in my reading and rereading of Greenleaf, I saw that he generally came back to time and time again. These characteristics seemed to me to be very important for him because they kept popping up in various pieces of his published and unpublished writings. In fact, I’m pretty sure that at one point I made a list of various characteristics and went through his published works and counted how often he mentioned a particular characteristic or word, and then I utilized that list as the basis for choosing the ten that he had most frequently talked about. Say what you will, I was very faithful to Greenleaf’s own sense of what was important—based upon the frequency of his returning to writing about them throughout his writings! Dittmar: So you identified terms that he actually used to describe various servant-leader characteristics, and you decided that these seem to be the 10 most frequently referenced ones, as opposed to you taking all the readings and saying now, as I read this I think, here are ten categories . Dittmar: Despite its success, that is, the way in which many have embraced the concept of servant-leadership, why do you think, from your experience, there is still inertia among many organizational leaders to resist servant-leadership, to consider it ridiculous or unrealistic to implement within their organizations? 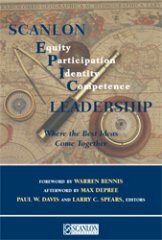 Spears: I guess I should preface my response by saying that most of the people I find in organizations and organizational leaders are people who are already either working with servant-leadership, or who are at a point in their own developmental lives where they’re ready to do something like that. Most people aren’t going to contact us, certainly most organizational leaders aren’t going to do so, unless at some level they’re wanting to learn more and feeling a certain yearning in that direction. They may not even know what it is they are looking for, but they’re at the point where they want to learn about servant-leadership, and so to that extent, I really don’t find a lot of resistance to servant-leadership. Now, I know of course though that there are many places where there are one or two individuals within an organization who are interested in servant-leadership, but they can’t get their designated leadership interested in it. Robert Greenleaf felt that servant-leadership can begin anywhere within an organization, and with anyone. It does not have to begin at the top. Resistance to servant-leadership, where it exists, can come for a number of reasons. Sometimes it is as simple as never having heard of it or thought about it before. Sometimes you encounter a deep-seated cynicism that exists within organizations and people. There are so many leadership models, leadership styles, and leadership ideas today, and I think, sometimes, that this simply breeds a cynicism that works against some people being open to servant-leadership. Sometimes we just aren’t ready in our own personal lives. And, some people look at servant-leadership and dismiss it as a “soft idea” without taking the time to learn about it. I can tell you that servant-leadership is hard work, but it’s well worth it. Dittmar: At times our students get discouraged as they personally begin to embrace servant-leadership and at the same time realize how difficult it would be to implement servant-leadership principles and behaviors in their workplace or organization, given the current conditions there. How do you respond to that challenge and how do you think Robert Greenleaf would have responded? Spears: Robert Greenleaf loved to tell the story of being a college student (at Carleton College) and of his going to class one day to listen to a professor who he thought was kind of boring by and large. On this particular day, Greenleaf said that his ears were more open than usual, and that the professor said something to the effect that the future of organizations and organizational change in the 20th century was to be found by people who made the commitment to go inside large organizations, spend a lifetime there, and who would seek to create positive change within those institutions. Greenleaf writes that his old professor, Oscar Helming, just clicked with him that day and he immediately decided that’s what he wanted to do. Just before graduation Greenleaf did some research, identified AT&T as the then largest corporation, and set his sights on joining AT&T, which he did. He started at the bottom. He started out digging holes for telephone poles in Ohio for a time, then he was asked to train some AT&T workers, and within a year and a half his supervisors took note of his management potential and he was brought to work in AT&T’s headquarters in New York City, where he spent the next 36 years. I think, for Greenleaf, that statement by his college professor was absolutely crucial to the arc of his own life story. I sort of worry a little bit about the frequent job changes that increasingly appear to be the norm today. I believe that it may actually prevent many natural servants from having the opportunity to rise within the organization chart and thereby developing the power to transform it in some positive fashion. Dittmar: Would you talk a bit about Robert Greenleaf’s experience in higher education and how that experience helped to crystallize his thinking regarding servant-leadership? Spears: Well, after leaving AT&T in 1964 he founded the Center for Applied Ethics, now called The Greenleaf Center. For twenty years Bob Greenleaf utilized the Center as a base from which he conducted his consultative work. In the late ‘60s and early ‘70s, Greenleaf was brought into a number of tense university campus settings to try and be helpful. And while he was frequently brought in by university presidents or trustee boards, he increasingly found himself drawn to the passion and concerns articulated by student leaders, to the point where he spent considerable time with student activists of the time to try and understand the nature of their concerns. Greenleaf also loved to go into university bookstores to see what students were reading. He noted that the German novelist Hermann Hesse was very popular among college students in the ‘60s, and he decided to read Hesse’s work in chronological order, along with a biography of Hesse’s life. Greenleaf credited his reading of Hesse’s book Journey to the East as the personal source of inspiration in his coining the term “servant-leader” in his 1970 essay, The Servant as Leader. Dittmar: From your own study and your brief interaction with Robert Greenleaf personally, what do you make of him as an individual in terms of how who he was as a person influenced his thinking and his writing? What was it about his person that is apparent in his writing? Spears: A couple of things come to mind. 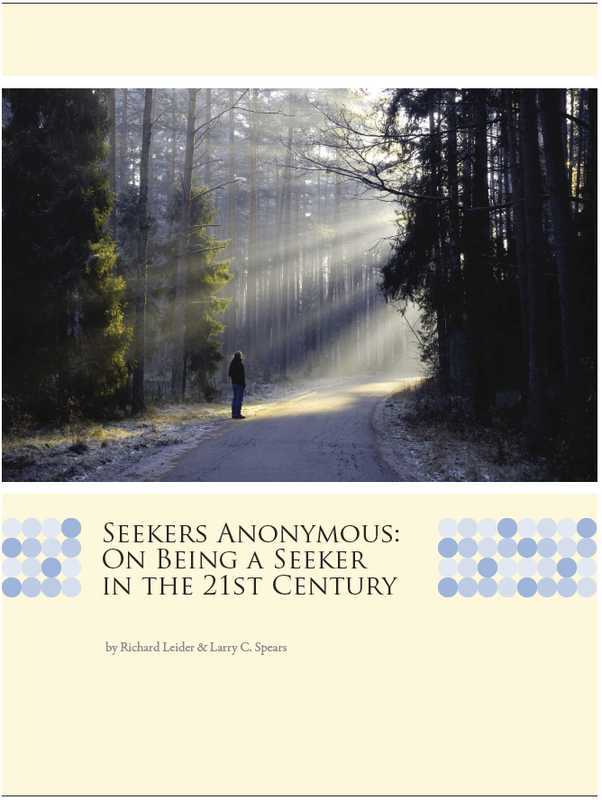 Greenleaf’s personal experience as a Quaker, coming to Quakerism around the age of 30, resonated with some of his personal characteristics. He was a very quiet, reflective person. He was notorious for answering questions with questions, and he clearly believed in the Socratic method as a teaching/learning tool. In speaking, he rarely said more than he needed to or wanted to. So I think there were some elements of listening and reflection that always just seemed to naturally be there. He took time throughout his life to try to figure things out, and to step back when things were kind of heated. While at AT&T, for instance, he often sought to reorient himself when things got tense. I think he spent a lot of time reflecting on foresight, and that’s another area of my own interests that I’d like to try to spend some time writing about in the future. Foresight is a very important quality for people and for organizations, but it’s also one that we don’t understand very well. Not a lot has been written about it. Foresight is grounded in intuition in a way that makes it really difficult to sort of talk about or write about. Greenleaf seemed to have a natural grasp of foresight—predicting what was likely to occur given the current set of facts—and I think that actually served him very well at AT&T and in other places. Dittmar: Did he ever share with you how he coined the term “servant-leadership”? Spears: No, he did not. I spent only a single half-day with him, just eight days before he died. Bob had had three or four strokes by then. By the time I met him in September 1990, he seemed mostly limited to one- and two-word responses. Prior to visiting with him, I had sent him pictures of our children, including my youngest son who had been born several months earlier on July 14, 1990. July 14th, besides being Bastille Day, was also Robert Greenleaf’s birthday. Bob chuckled when I told him that someone had suggested that I might have scheduled Matthew’s birthdate to take place on Bob’s own birthday of July 14 [laughter]. Bob wrote in several places about his decision to bring the words “servant” and “leader” together. He understood that some people would find the phrase “servant-leader” to be quite challenging, but as he says in the opening of The Servant as Leader essay, he could think of no other two words that better described for him what it was he was trying to communicate. I think he really sought to reclaim our understanding of the meaning of the words “servant” and “leader.” I have occasionally come across people who express their discomfort for the word “servant”—sometimes for the word “leader,” too. And while I don’t have any strong objection to terms like “serving-leader” or “service-leader” or several other variants I’ve come across over the years, I do question the felt need to shy away from Greenleaf’s own phrase, “servant-leader.” It has a depth of meaning and power for me that those other terms simply don’t have. Dittmar: Do you see any new developments or directions regarding the Greenleaf Center? We’ve spoken about some of your own interests; are there new things on the horizon for the Center itself? Spears: What we’re doing now represents many of the things that I hope we will continue to do. One very important item has to do with our international work, which has grown from nothing a decade ago to a really sizable piece of our work. We spend a lot of time working with our partners and colleagues in other countries, and there are now eleven international Greenleaf Center offices around the world. The creation of translated materials—servant-leader essays, some of the books, other materials--is taking place and is adding greatly to the growth of international interest in servant-leadership. There are other specific areas of applications of servant-leadership that I hope to see us move into. Healthcare is one such area. We have seen the number of people coming to us from healthcare institutions jump dramatically in the last five to six years, and we’re now starting to put together a kind of a corollary program to our Leadership Institute for Education. Publications were important vehicles for Robert Greenleaf, and they remain so for me. I trust that will always remain a high priority for the Center. As an organization we are increasingly focusing our efforts on reaching more and more diverse audiences. Over the past three years I have also been developing some of my own ideas about the potential that I believe servant-leadership holds as common ground for people of many different faiths and philosophies to overcome their differences, and to discover the many ways that servant-leadership unites us. It breaks my heart to think of the tremendous bloodshed that has been caused throughout history by religious differences. Servant-leaders simply must increasingly take the lead in finding ways to help heal these divisions, and I believe that the language of servant-leadership, as articulated by Bob Greenleaf, offers the world an important pathway toward a better future. I wish it was possible for me to just sit down for a couple of years to think and to write in a more developmental way about servant-leadership as a unifying idea. In order to do that I would need to let go of a lot of the operational side of The Greenleaf Center and also locate someone willing to provide financial support! I have two teenage boys about to go off to college, a mortgage, etc., and so it isn’t likely that I can do that anytime soon. I guess until I can find an answer I will simply do what I’ve always done: Do my institutional nurturing work during the weekdays and squeeze in whatever time I can to write and to edit in the evenings and on weekends. Though that does tend to make one tired! The latest thing, I might just mention, is The International Journal of Servant-Leadership, which we’re doing in collaboration with Gonzaga University. It is my hope that over the next few years the journal will help to move forward servant-leadership as an area of legitimate practice, research, teaching, study, publications, etc. among faculty members and graduate and undergraduate students. I’ve had a long interest in higher education over the last thirty years, and so that’s a special hope of mine that I want to try to move forward. Dittmar: You mentioned that there are ten international Greenleaf Centers currently in existence. Do you find that there are groups whose cultural values seem to resonate to a greater or lesser degree with servant-leadership principles? Spears: The Greenleaf Center has a growing network of twelve Centers around the world. To date, these countries include: Australia/New Zealand, Brazil, Canada, Germany, Korea, Japan, The Netherlands, the Philippines, Singapore, South Africa, United Kingdom, and the United States. I find many more similarities than differences among servant-leaders all around the world. Interestingly, the term “servant-leader” invariably sparks the same kinds of reactions everywhere—mostly positive, occasionally negative, but always thought-provoking. I haven’t encountered any cultural differences that have suggested to me that there is any particular country or culture where servant-leadership is perceived differently than anywhere else. Robert Greenleaf once said that servant-leaders aren’t found in plentiful numbers anywhere, and that they should be. Thirty years later I would say that servant-leaders are found in gradually increasing numbers everywhere. The advent of the Internet has also helped in this regard; today, servant-leadership increasingly has a global face. Dittmar: At times, our students, as well as others with whom I have contact, raise questions regarding the “bottom line” benefits that servant-leadership can have to an organization. What is your response to those who may not be convinced in principle to embrace servant-leadership, but might if it brought financial payoffs as well? Spears: This question comes up with some frequency when I speak to groups. My answer to it is one that is sometimes less than satisfying to the questioner. My brief and direct response is simply that there are a number of dissertations and studies which have compared servant-led companies against their competitors, and which have shown that those servant-led companies have either done as well as or better than their competitors. However, I usually choose to emphasize a follow-up in response to this question: There is no end of ideas that have been proven by “objective studies” and “quantitative analyses.” And while I’m happy that such studies and analyses exist, I don’t believe that anyone really ever adopts a personal “belief” primarily based upon proven data. I think the very best reason for embracing servant-leadership is that it just seems like the right thing to do. That’s why most servant-leaders are servant-leaders—it just seems like the right way to live one’s life to the best of our abilities. I have very little interest in trying to “prove” to anyone that servant-leadership exists and that it’s a good thing. Servant-leadership is invitational by its very nature. One can accept or reject it for a broad range of reasons. I do have a great deal of interest in sharing the idea of servant-leadership far and wide, and with those who find it a deeply resonant idea at the deeper level of values, spirit, and human development. I am personally convinced that servant-leadership works for people, for organizations, and for society. Dittmar: What’s your reaction to the Regent University Servant-Leader Roundtable during the last day and a half? Spears: I’m still in the middle of it, so I’m processing it even as we speak. In truth, I had some trepidation about coming. My personal definition of servant-leadership matches very closely the one that Robert Greenleaf wrote about. I also have a view of servant-leadership as a big tent under which anyone and everyone is welcomed. We have always had people from different denominational backgrounds and faith beliefs and personal philosophies involved with the Center, and I just wasn’t sure how my essentially non-Biblical view of servant-leadership would be received here at Regent. I don’t like to label myself or others on matters of spirituality, but I suppose the term “Quaker Universalist” might come pretty close to pinning an accurate label on me. We live in a world of many different faith traditions, and I believe our great challenge is to search out the commonalities, more than the differences, and that applies to faith traditions as well. In accepting the invitation to come to Regent University, I wasn’t sure what to expect among the folks who were here. I’d had a very good conversation with Kathleen Patterson [Regent University Leadership Studies professor] last year when she came to visit me at the Greenleaf Center in Indianapolis, and I came away with an optimistic impression about what was happening within the Roundtable. Then I went online and began to read through some of the papers, and where I found a mix of papers, including quite a few that I thought were just excellent. Over the past fifteen years I have encountered people on both ends of the servant-leadership spectrum who have concerns of one kind or another. On one end, I have occasionally encountered folks who are suspicious that servant-leadership is simply some kind of Christian leadership model encased in non-religious language. At the other end of the spectrum, I have encountered folks who have some difficulty accepting Greenleaf’s definition of servant-leadership and will only accept a fundamental, Biblically-grounded definition. The vast majority of people are found somewhere in between those two opposing ends of the spectrum. Most people recognize the breadth of the understanding and practice of servant-leadership and easily accept it as being congruent with whatever faith or philosophies they may personally embrace. I believe that servant-leadership does not require anyone to relinquish their personal religious or philosophical beliefs in order to be sincere servant-leaders. There are sincere servant-leaders who are also atheists. There are sincere servant-leaders who hold a fundamentalist/Biblical understanding. Neither one is required to change whatever their beliefs may be in order to act as a servant-leader according to Robert Greenleaf’s description. Now, some people I think have found that their spiritual lives deepen through their sustained efforts to live as servant-leaders. I have a concern that servant-leadership not be misunderstood as a Christian-only leadership model—Greenleaf’s understanding of servant-leadership is resonant with every faith and philosophy. And so I had that concern on my mind in coming to the Roundtable. I’m happy to say that my actual experience in the last 48 hours has been quite positive. I’ve had a dozen different wonderful conversations with folks. We’ve sometimes agreed, sometimes disagreed, but each conversation has been both sincere and loving in nature. I’ve also been impressed by the scholarship, and by the overall quality of the presentations that I’ve heard. Many of the topics and themes covered here are also topics and themes that would be quite at home in our own conference. I’m especially impressed with the work of the Roundtable’s key organizers, Kathleen Patterson and Bruce Winston [Dean of the School of Leadership Studies at Regent University]. On a personal note, I have been humbled by the love and friendship that I have experienced here in the past 48 hours. Instead of hostility, I’ve encountered kindness. Instead of politics, I’ve encountered several great examples of the Quaker John Woolman’s belief in friendly persuasion. There are a lot of really encouraging things going on here at the Servant-Leader Roundtable. I was saying to Kathleen earlier that I think this is the kind of program that I would like to begin to try to attend annually, and to let others know about it. From what I’ve seen, this is a tremendous resource for servant-leaders, and particularly for people in higher education who wish to learn and grow together. I will be leaving my first Servant-Leadership Roundtable with the feeling that I have encountered some kindred spirits. I hope to be back. Dittmar: Larry, thank you very much for taking the time to meet with me and for your thoughtful answers to all of these questions. Spears: And thanks so much for this conversation, which I’ve enjoyed very much. James K. Dittmar is the Chair of the Department of Leadership Studies at Geneva College in Beaver Fall, Pennsylvania. The Master of Science in Organizational Leadership program at Geneva uses servant-leadership as a foundation and continuing theme for its students. Almost every course has some aspect of servant-leadership. Books used as texts are The Servant as Leader essay and Insights on Leadership.